Looking for a luxurious retreat away from the city? Bliss Villa, only an hour and a half drive away from Pune ticks all the boxes needed for a stylish getaway. Bliss Villa, a sprawling four-acre property is located in Bhugaon, Mulshi. 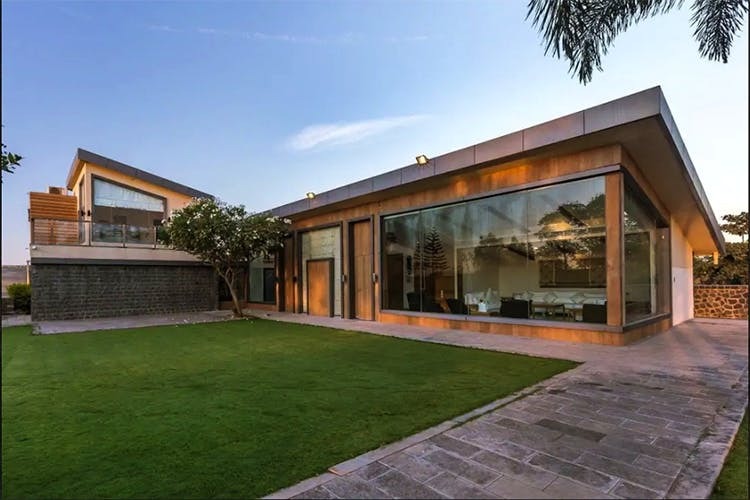 The 4-BHK villa boasts of sleek, stunning interiors, a private pool, a home theatre and beautiful, landscaped gardens. They also have their own organic vegetable plantations. You can spend the day lazing around in bed or cosy up watching your favourite movies or take a dip in the pool. Also, you can visit the Mulshi dam, Khadakwasla dam and Manas lake; all within close proximity. The villa can accommodate up to 16-18 guests. One night at the villa costs INR 30,000, which can be split if you're a large bunch heading there. Just a heads up, there are power-cuts on Thursdays in Bhugaon. However, the villa has power back up, sufficient for basic needs. Also, only vegetarian food is allowed on the premises of the villa. We wish the villa could provide WiFi services and allowed pets on the property. A short drive from Pune, bookmark Bliss Villa for your next lazy weekend with your loved ones.